I played around with breaking away from the columns I've been working in. I was pretty sure I wanted to stick with them, but sometimes it's good to ask the question. So I went back to my original plan. Fun to see the what ifs and how it solidifies how you feel about the plan at hand. Whatever you decide, I love the yellow/navy more each time I see it. Something about the pops of yellow just makes it all sparkle. Good to play around a bit - glad you are back on track and more sure of your plan. The yellow strips are bold and seem to be dictating which direction to go. There are so many directions you could go with this. Embracing the yellow strip and spreading them throughout the piece will definitely make a statement. So fun and sparkly looking! 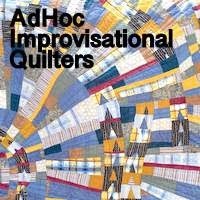 I like the glorious way your process explodes across all your quilts!! I actually liked how you changed around that bottom half but do see your issue of the top half then. Having said that now I see you have gone with your original setting and addition of the partially finished RH column, it's looks great! Wow, there's some design thrills going on here! The big 'what if?' Lovely! getting me out of a rut. You never know unless you give it a try. I ,love the what if. And I have even learned to take photos so I can get back to something I liked. Learning curve there.